Behind every strong man, as the saying goes, stands an even stronger woman, and in Cambodia's recent tumultuous history few strong women stand out more than the Khieu sisters. Daughters of a judge and among the country's first female intellectuals, Ponnary and Thirith were sent to study in Paris in the 1950s where they met and later married two other Cambodian students  creating a foursome that went on to form the nucleus of one of the world's most brutal regimes. The elder Khieu sister, Ponnary, married Pol Pot, leader of the fanatical Khmer Rouge movement which fought its way to bloody victory in Cambodia in 1975 and then established a regime under which an estimated 1.7 million people died by 1979. 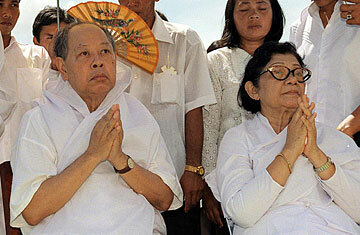 Her younger sister, Thirith, wedded Pol Pot's confidant and Khmer Rouge foreign minister, Ieng Sary; she also served as the regime's minister of social action and education. Monday marked one of the last chapters in this dark family history as Ieng Sary and Ieng Thirith were arrested on charges of crimes against humanity, to be brought before a U.N.-backed tribunal set up to try the surviving leaders of Pol Pot's regime. Gendarmes and police special forces sealed off the area around the couple's large villa down a leafy side street in Phnom Penh, where they had lived as macabre local celebrities since striking surrender deals with the Cambodian government in 1996. The tribunal's co-investigating judges released a statement Tuesday confirming the formal charges against the couple and announcing that the Iengs' lawyers have requested time to prepare their clients' defense ahead of a hearing on the question of pre-trial detention. That hearing will take place Wednesday; in the meantime, Ieng Sary and Ieng Thirith are being held in custody at the ECCC, the judges said. The Iengs have also said that they cannot afford to pay for attorneys to represent them at the tribunal; the court will cover their legal costs while it assess their claim. Since defecting to the government in 1996, Ieng Sary has regularly denied any knowledge of the regime's policies of extermination. Ieng Thirith has been even more vocal: several years ago, she made a withering written attack on Youk Chhang, Cambodia's foremost genocide researcher, claiming his years of research into the alleged crimes of Khmer Rouge regime had found not a shred of incriminating evidence and that his work was nothing "but lies and defamation." Youk Chhang, for his part, says Ieng Sary was considered one of the "untouchable" Khmer Rouge leaders. His arrest and that of his wife have sent powerful messages to the Cambodian people that the tribunal is truly working to find justice for the victims of the regime. "[Ieng Thirith] was minister of social action and education," Youk Chhang says. "She will have a lot to tell us [in court]." The Iengs' arrests are the third and fourth of five former Khmer Rouge leaders targeted by the co-prosecutors at the Extraordinary Chambers in the Court of Cambodia (ECCC)  the official name of the U.N.-backed Khmer Rouge tribunal established in Phnom Penh. Kaing Guek Eav, better known as Duch, the regime's chief jailer and torturer, was the first suspect to be detained in July. Second-in-command Nuon Chea was arrested in September. Khieu Samphan, the regime's onetime head of state, is the last surviving senior leader at large and many believe that his is the fifth name on the prosecutors' list. ECCC officials expect that trials will begin early next year. Neither Ponnary nor Pol Pot lived long enough to see the tribunal established; Ponnary was bedridden and suffering from insanity when she passed away peacefully in 2003 at the age of 83. She had lived out her final years in the Iengs' villa, with its manicured lawns and small ornamental pond, oblivious of the fact that Pol Pot had remarried many years earlier. Pol Pot himself died in 1998, denounced by his own followers, in a jungle shack near the Thai border. As court and police officers prepared the Iengs for the drive to the tribunal's detention center on the outskirts of Phnom Penh Monday, neighbors came out to wish them good riddance. "They killed many people and they must be prosecuted," says Pouk Salonn, 57, the owner of a small shop near the Iengs' villa who lost her parents during the regime. But with the passage of some 30 years since the Khmer Rouge regime committed its crimes, the arrest of the elderly pair  Sary is 82 and Thirith is 75  was little consolation. "Why are you only coming to ask questions now?" she asks, noting that there seemed to be more media attention on Pol Pot's terrifying reign now than there was when he was actually in power. "[The regime] was a long time ago already."